Ball entered the Royal Navy, and in 1778, was promoted lieutenant. Three years later he began a close association with Sir George Rodney. Ball was promoted commander in 1782, two days after his chief’s crowning victory, and on 20 March 1783 he became captain. With peace restored, Ball was furloughed on half-pay. He then spent a year in France, hoping to learn the language and live economically. Captain Horatio Nelson was at this time by no means favorably impressed by his future friend and comrade, and described Ball as a “great coxcomb”. In 1790, Ball received a command and from then on he was continuously employed. In 1798, Ball commanded the HMS Alexander in the Mediterranean. Once when Nelson’s HMS Vanguard had lost her fore- and topmasts, Ball towed Vanguard to Sardinia. Under Nelson’s command, Ball took part in the Battle of the Nile, and his ship, the Alexander, was the second British ship to fire on the French Admiral’s flagship, L’Orient, which later blew up during the battle. Alexander Ball was an important figure in the diplomatic and military events that brought Malta under British rule. Universally loved by the Maltese, Ball visited the islands for the first time in 1798. Whenever Ball appeared in public, the passers-by in the streets stood uncovered until he had passed; the clamours of the market-place were hushed at his entrance and then exchanged for shouts of joy and welcome. His mission was to sustain and continue the siege and blockade of the French forces in Malta, aided by certain Portuguese naval forces. The Maltese leaders of the blockade were immediately attracted by Ball’s charisma and sympathy. Moreover, they might have realised that after the eventual French surrender, their island would have to find another ruler, since no Maltese in the nineteenth-century considered independence. The fear of the return of the increasingly oppressive Order of St. John may have pushed Malta indirectly toward becoming a British protectorate. In a letter sent by one of the Maltese leaders to Ball, written by Vincenzo Borġ, the Maltese expressed the wish to Ball that the vast majority of us wish to see the islands fall under English jurisdiction. The destiny of the Malta was to be decided by the events occurring in Europe during this period. Napoleon’s troops succeeded in entering Naples itself, forcing King Ferdinand IV to flee the city with his family. For the Maltese this meant that only Britain could guarantee Malta’s safety. It was at this stage that problems emerged between the supporters of the Neapolitans and those preferring the Royal Navy. Captain Alexander Ball succeeded in calming the situation, and this led to his eventual election as the President of the National Assembly that took place on 9 February 1799. According to Ball’s wishes, the Assembly changed name to National Congress in order to emphasise the need for a compromise. However, the increasingly precarious situation faced by King Ferdinand IV made Ball pass more powers to the British forces stationed in and around Malta. In fact, it was a this time that the Union Flag was flown for the first time alongside the Neapolitan flag. The French forces besieged in Valletta faced starvation as the British navy intercepted a French relief force of Lampedusa Island. Eventually, General Vaubois, the commander of the French forces, surrendered to the British forces, represented by Captain George Martin and Major General Henry Pigot. As a representative of the Maltese people, Ball was not allowed to take part in the negotiations, while the Neapolitans were excluded for diplomatic reasons. The French were allowed to leave with full military honours, and after a few days Ball and the Maltese could enter the liberated capital. 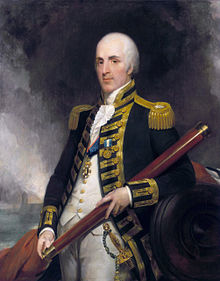 In 1801 Ball was appointed commissioner of the navy at Gibraltar and had to leave Malta. Control passed to Major General Henry Pigot, whose tyrannical administration angered the Maltese, a fact noted in a letter Ball wrote to Nelson in June of the same year. Ball reported that the Maltese would have rebelled against Pigot had Ball not promised them that he would convey their grievances to the authorities. The British were uncertain of their policy towards Malta, as with Napoleon on the rise they could not afford problems with their allies. The choice of Charles Cameron as Civil Commissioner in May 1801 did not remove these uncertainties, even though his presence assured the Maltese of the protection of the Empire. When the Treaty of Amiens placed Malta again under the rule of the Knights of St. John, this assurance was dashed. Ball was made a baronet in 1801. The British government then sent him back to Malta as the Plenipotentiary Minister of His British Majesty for the Order of Saint John to coordinate the departure of the British in accordance with the provisions of the Treaty of Amiens. The situation, however, changed quickly as the likelihood of war between Napoleonic France and the United Kingdom increased. Ball now received instructions to delay the evacuation of British troops from the island. Napoleon was anxious for the moment to see the British out of the Grand Harbour, stating that he would prefer to see the British in possession of a Parisian suburb than of Malta. In May 1803 war was rejoined because of the British refusal to evacuate the islands. After the Napoleonic Wars, through the Treaty of Paris of 1814, as ratified by the Congress of Vienna, Malta and all its dependencies passed under the jurisdiction of the British. Sir Alexander Ball was possibly the British leader most loved by the Maltese population. Samuel Taylor Coleridge became an assistant to Ball in 1804 and later described his administration in The Friend, going as far as describing Ball as “a truly great man”. Ball died in the San Anton Palace on 25 October 1809 and was buried in Malta. In the Lower Barrakka Gardens in Valletta, the Maltese in 1810 built a monument in Ball’s memory. Restored in 1884, this Neo-Classical monument remains a testament to the Maltese peoples’ love and respect.